Here is the video from my 2010 Event Technology Shopping list presentation with Ruud Janssen at EIBTM on 1 December 2009. For those of you stuck outside of the room on Tuesday, I am sorry that you were not able to attend live. Hopefully, this video is an acceptable substitute. To set expectations – the video is not professional grade. We shot it with my home movie camera. So please excuse the camera position, video quality and the start. We missed the introductions and first ARS questions. The video is 52 minutes long – so watch it with a fresh cup of coffee and a pastry! Finally, I hope that you find some usable ideas that can be applied to your 2010 events. Enjoy! Special thanks to Maarten Vanneste for operating the camera, getting a decent shot of the presentation and moderating the session. Without Maarten’s help, we wouldn’t have this video to share with you. Yesterday, my colleague Ruud Janssen and I delivered a presentation called the 2010 Event Technology Shopping List at EIBTM. I will post the slides and video soon. But, first I wanted to share some of the thinking that was at the heart of our work. We have the opportunity to stretch event experiences from 1-2 days to several days, weeks and months. Rather than looking at the meeting as an isolated event – we can look at it as one point in a conversation stream. By using your digital touch points wisely, you can start relationships earlier and change the nature of the face-to-face interactions onsite. Webinars, webcasts, social networks and social media tools are some of the technologies making this possible. The people that come to your event are a subset of your event community. For one reason or another, there are some people that cannot come to your event. It has nothing to do with you, your program, the venue, the destination or the price – they just can’t come. Rather than ignore these “potential” attendees – the technology tools like the backchannel and live streaming help you include them in your event experience. Attendees are smarter than they have ever been. The gap between the experts on stage and the attendees in the audience has never been smaller. The collaboration tools that we have at our disposal have made it easier than ever to create this interaction. Equally important – there are a large number of audience response keypads, gadgets, handheld devices and mobile applications that put the power in the attendee’s hand and make it easier for you to engage them: Ask questions, collect ideas, vote, etc. We still live in a world where good projects (meetings, marketing plans, etc.) are being cut in favor of better projects. Telepresence and Virtual Events are two event formats that have emerged as viable lost cost alternatives (or compliments) to full face-to-face events. While some face-to-face diehards may initially raise their noses at these two formats – I suggest that you take a closer look. I would prefer that you keep some options in your back pocket and fight for your projects – rather than accept defeat when the finance department and management want to cut your event. 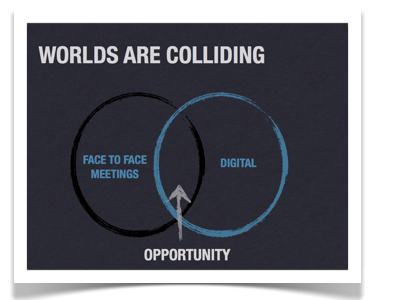 The collision between the digital world and the face-to-face world creates several new opportunities for events. By framing the discussion in terms of these new opportunities – you can strategically approach technology rather than look at it tactically. That’s my take – what do you think? Today’s event technology has the ability to engage audiences beyond your meeting, conference or event. From time-to-time, your passionate members and raving fans will not be able to attend your events. While that is a pity – you don’t have to ignore them. Channel your Inner-Chalkbot and find ways to include these people! You don’t always need sophisticated interactions – a simple text message will do. Endless PowerPoint presentations and stale ham sandwiches have been making attendees comatose at meetings and events for decades now. While many event organizers recognize the need for more interaction, few know where to start. Most leap for technology tools and new formats. By immediately starting with technology solutions, you risk over-engineering OR under-engineering your interactive experiences. In my opinion, there is a better way. I prefer to start with this seemingly simple question: What are attendees supposed to do as a result of this interaction (or session)? Tell 47 people that your company rocks! I view answering the question above as setting the interaction dial, because it sets a target for your interactive experience. Also, interactions have different intensity levels. Some interactive solutions are really simple (like having attendees ask questions). While others are complex (like brainstorming with 500 people) and require additional planning, design, session time and sophisticated tech tools. By setting the target – you make it easier to match the interactive experience to your desired outcome. After you set the interaction dial, don’t be shy. Get your stakeholders involved in creating a solution. Ask the speakers, facilitators, meeting designers, A/V team and technology services providers to help you. These are smart people. Don’t be afraid to use them. 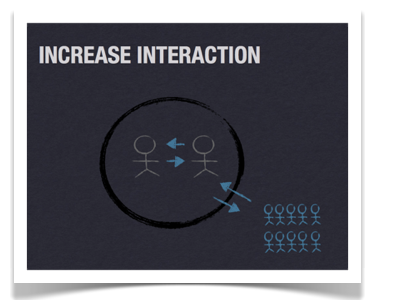 When you are planning interactions – start by thinking through the action that you want attendees to take afterward. Then, work on matching the right processes, event formats and interactive technology to your objective. 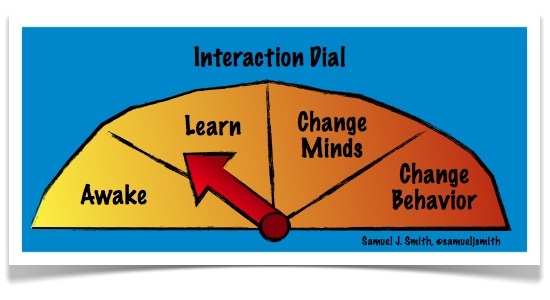 Where will you set the interaction dial? Esquire magazine did something really cool and innovative! They turned their paper magazine into an interactive experience with augmented reality. While the idea is novel – I like how they gave readers several interactive experiences. Truthfully – probably not much right now. However, that didn’t stop me from coming up with a few ideas! The first thing that came to mind was combining this technology with brochures to create interactive experiences that would work at tradeshow kiosks, small events and on the prospect’s computer. It brings your brochure to life, your brand to life and creates a reason for people to keep your marketing materials. Also, it gives you one digital marketing tool that can be used in several customer/prospect encounters. Another possibility that I saw was in real time segmentation and lead qualification. Think about this: a person picks up your brochure, goes to the interactive kiosk at your booth and holds up the pages with the features/benefits that are important to him. Then, he sees some content that is relevant to his needs. When he is done, there is a place for him to answer a few questions, enter his contact information and take the next step in your marketing/sales process. If you do it right – he could end up with an email on his smart phone asking him to meet with a company representative later that day. This is a fun technology that we are going to see start popping up in more places. For now – it is probably just something cool. Expect the technology to become more sophisticated and cheaper as more people start to use it. Sunday evening, Twitter was buzzing about Google Wave being used at the recent EComm Conference in Amsterdam. The Fresh Networks Blog did a nice job of recapping the power of Google Wave in Google Wave vs. Twitter at Conferences. To me, this event demonstrated how you can tap into the energy and brainpower of the attendees to share, communicate and collaborate at events. Build group summaries of the sessions. Provide feedback on sessions, etc. What if you brainstormed a bunch of ideas in a plenary session through Google Wave and prioritized them on the spot. Then, you could assign one or two topics to each break-out session. Ask the teams to expand on the ideas and make recommendations for next steps. It they used Google Wave, they could end up with a summary document and action plan. In this scenario, you would avoid the flip charts, the massive amounts of handwritten notes, the situation where notes were left in the conference room, etc. Everything would already be “digitized” and ready-to-share. So, when attendees return to the office, they can maintain the momentum of the event and start making change happen. Sounds like a good idea to me. What about you? Google Wave is still on a limited release. Wifi access/connectivity in many venues is still questionable. If you have a room full of laptops, netbooks, etc – then you need to provide power strips and tables. We still need to learn more about using the tool and how to best apply it for collaboration. I think Google Wave has demonstrated that it can be a powerful accessory to engage the audience, create interaction and enhance collaboration at events. Once it rolls out, it may be something to consider for your events. What do you think? Do you want your attendees doing the wave and engaging in mass collaboration? Which Event Technology Delivers The Best ROI? Today, I was asked to pick ONE event technology that offers the best ROI for events. The questioner didn’t want to hear –“well there are several choices depending on your needs – blah, blah, blah.” He wanted one answer. He wanted it on the spot. For me, this was gut-check time. So – I blurted out: Virtual meetings and hybrid events. I made a good choice. Though, I imagine some of you are thinking that I must be riding the crazy-train to loony land. So, here’s the deal. I will share the reasoning for my choice below. Then, I need you to push back. Pick an event technology that you think offers a better ROI and make your case. This event format is building communities and including more people in events than ever before and doing it for less. Cisco recently reported that they cut their event expenses by 90% by hosting a virtual meeting. It makes sense – when you host a virtual event you avoid travel, venue and F&B charges, etc. 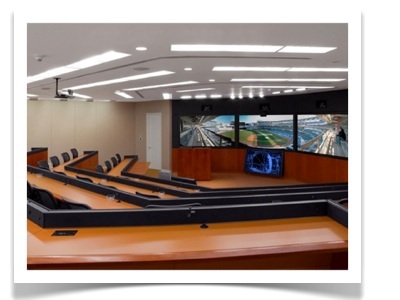 GE is using massive 60 person Telepresence centers to avoid long distance travel and save money. One executive traveling to Asia for a meeting can cost more than $30,000 and more than 6000 pounds of carbon emissions. BlizzardCon in Anaheim, California, USA was sold out. They had 20,000 participants onsite and over 100,000 people attend virtually or through pay-per-view on DirectTV. In October, ITU’s Telecom World in Geneva had 40,000 participants onsite and Broadcast the entire conference to over 100,000 people around the world. Equally important, I think using virtual as a compliment to face-to-face is good for your event. 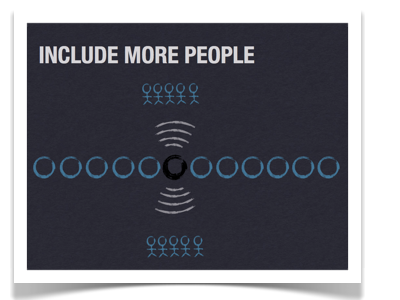 Imagine using virtual activities to drive people to your face-to-face event. 34% of the Cisco virtual attendees reported that they would like to attend a face-to-face event in the future. 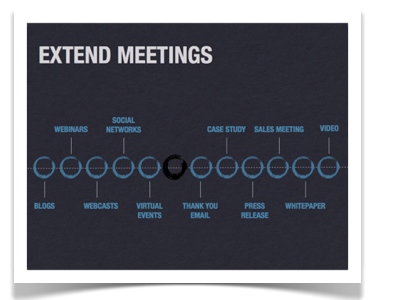 Virtual events are not right for all meetings. 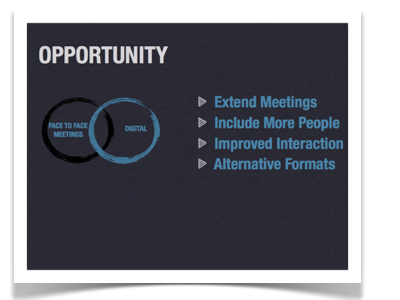 Forbes recently published a report on “Business Meetings: The Case for Face-to-Face Meetings.” In that report they interviewed 750 business executives that agreed that Virtual Events are best for “Presenting Data” and “Information Dissemination.” In all other cases, the executives agreed that Face-to-Face meetings were the best solution. Virtual & hybrid events offer event planners another way to connect to a larger community, drive attendees to your face-to-face events, save money and reduce carbon emissions. Sounds like a great ROI to me? Ok – the floor is yours – Make your case. It’s Halloween: Are Your Events Haunted by the Blackberry Prayer? You know the blackberry prayer. It’s that pose that attendees adopt when they stuff their faces into their blackberry devices (or iphones) during the keynote address or breakout sessions. You know – at the exact moment that they should be listening. For some speakers and event organizers this can be embarrassing and frustrating. After all the content is supposedly important stuff. Based on what I am hearing and reading in discussion groups – it seems to be haunting events. 1 in 4 new mobile phones sold in the US is a smart phone. 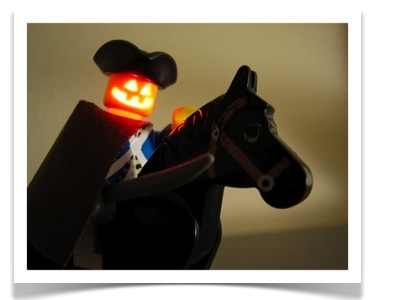 Besides dressing up as the headless horseman and throwing flaming pumpkins at attendees (which, by the way, I don’t advise) – what can you do to get attendees to look up and pay attention to the speaker? 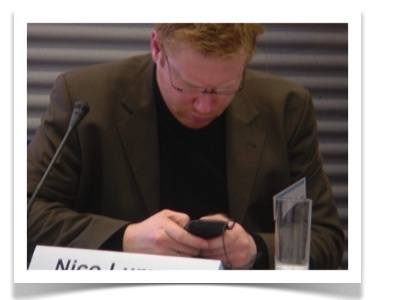 You can’t prevent people from using their smart phones at your event – but you can engage them through the smart phones. Ask attendees to use their devices to look up answers during a session. Ask them to tweet you questions or comments. Or use one of the mobile event applications that helps them keep in touch with you and the event. Ghosts, Goblins and Blackberry-using-attendees do not control your event experience – you do. When it comes to addressing the growing number of mobile devices at your events you have two choices: Trick or Treat. Let me know if you have any alternative witches brew that might be useful here. Happy Halloween! Who Else Wants To Have Fun At Events? What would happen if you made walking up the stairs more fun than taking the escalator? What would would happen if you made it fun to put bottles in a recycling canister? In this second example – they turned the insanely annoying task of recycling glass into a really fun game. Watch the video to see how they did it. Be sure to checkout the results. What Does This Mean For Your Events? Just like the examples above, you can use technology and “fun” to change experiences and change behaviors. Consider the dull activities at your meeting or conference. What would happen if they were fun to do? Would attendees learn more? Would attendees change their behaviors? Fun is a serious ingredient! Let’s not forget about it. Who else wants to have fun? With hundreds of new event technologies hitting the global events market each year, it can be maddening to figure out where to start and what to use. To help you, my colleague Ruud Janssen and I have developed an event technology shopping list. On Tuesday, 1 December, we will be presenting our 2010 Event Technology Shopping List to the participants of the EIBTM Tech Hour at 1pm. Here is our promotional video. When you are cooking, you combine different types of ingredients to prepare your dishes. We think that the combination of tech ingredients is what makes the attendee experience great. The shopping list analogy comes from the ingredients that you need to go get or hire. Plus, not every tech tool (or ingredient) will be appropriate for your event. For example, just because you like apples – doesn’t mean that they are appropriate for every dish. The same is true with event technology. Finally, the shopping list supports my strong personal desire to make sure that each participant in the session goes home with something tangible and actionable for their next event. How Will We Sort Through the Madness? Allow you to do more for less. Our List of Event Tech Tools? We already have a list of over 200 event technology tools. This includes the 48 participants in the EIBTM WorldWide Technology Watch Contest that was won by Pathable. We know that we are missing several others. Soooo – if you have a product or service that you would like to recommend – please tell us about it. We will be happy to include it in our process. You can either leave a comment on this post OR send me an email at samuel_j_smith at yahoo.com. The motivation behind this project is to create a tool that helps meeting and event organizers sift through event technology. Based on what you can see in this post – what will help you with your job the most? What are we missing that we need to include in the process and analysis? I hope to see you in Barcelona at EIBTM in December!